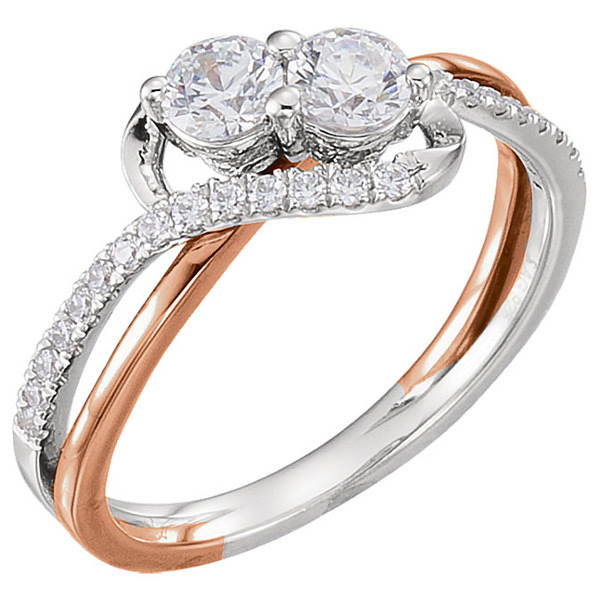 One of our most unique 2-stone engagement rings weaves together 14k white and rose gold (representing two souls as one) and features two 0.25 carat center diamonds with another 0.27 carats of round white side diamonds along the band, making up a total of 0.77 carats of diamonds (3/4 carat) on this unique 2-stone diamond engagement ring. The diamonds are H Color, SI2 clarity. There are 2 diamonds at center, 26 diamonds along the band. Available in women's sizes 6 - 8, including half sizes. Each band measures approx. 2mm and setting height of the diamond is 6.2mm tall. Also available in 14k-two-tone gold, shown below. We guarantee our 3/4 Carat Rose and White Gold 2-Stone Diamond Engagement Ring to be high quality, authentic jewelry, as described above.